Henley Swim has received national recognition for the quality of their events, following exceptionally high athlete ratings in the Racecheck Awards. 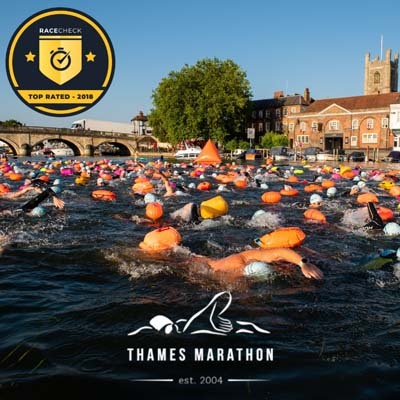 The Thames Marathon, a 14km swim from Henley to Marlow, received the Top Rated Swim Award for the second year running. Of the 5 Top Rated Awards given for a variety of sporting events, including swimming running and triathlon, the Thames Marathon was the only one to retain the accolade for a second year. The Henley Classic, the unique dawn swim that takes place on the Henley Regatta course, was awarded a Silver Award, receiving athlete ratings of 4.79/10 – narrowly missing out on a Gold Award which requires a rating of 4.8. From the many thousands of mass participation events that took places across the UK in 2018, only 22 received an award. The Henley Classic and Thames Marathon were the only swims to receive recognition, and Henley Swim was the only organisation to receive more than one award. The 2019 Henley Classic will take place on Sunday 30 June, and the Thames Marathon on Sunday 4 August.